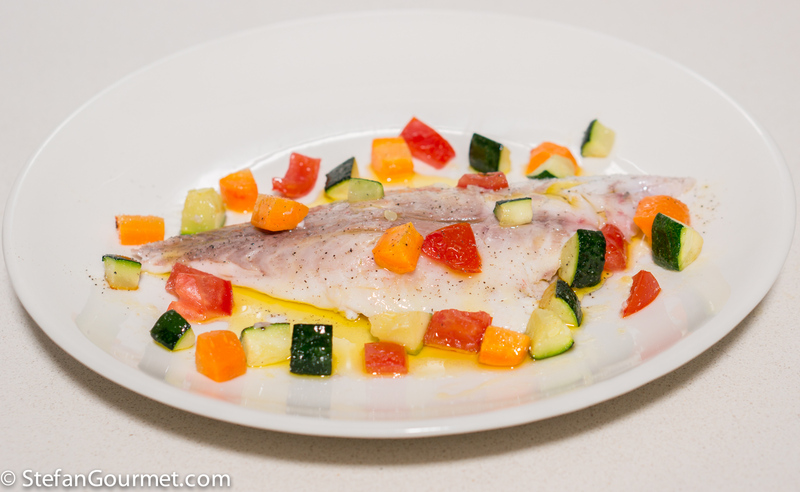 This is how sea bream (daurade) was served to us in Corsica: cooked in the oven with some colorful vegetables. When ordering fish on Corsica, be careful about the price. On the menu this daurade was listed as 12 euros per 100 grams. We shared an 800 gram fish, which set us back 96 euros. So it makes a lot of sense to make this at home instead, as it is quite easy as long as you use a thermometer. 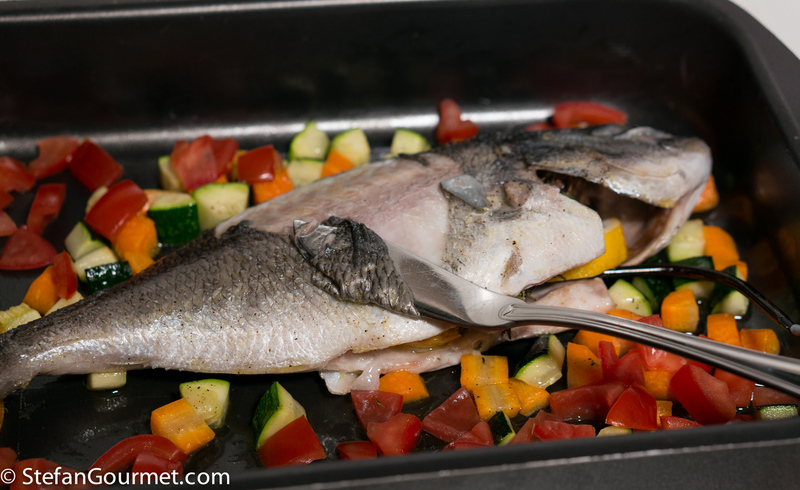 Sea bream overcooks very easily and will then become dry and boring. With a thermometer you can’t overcook it. You could encounter a very similar dish in Italy. It would then be called orata al forno. In many restaurants it will work like this. The waiter will come by the table with a large platter full of fresh fish. You pick which fish to cook and how you would like to be cooked. 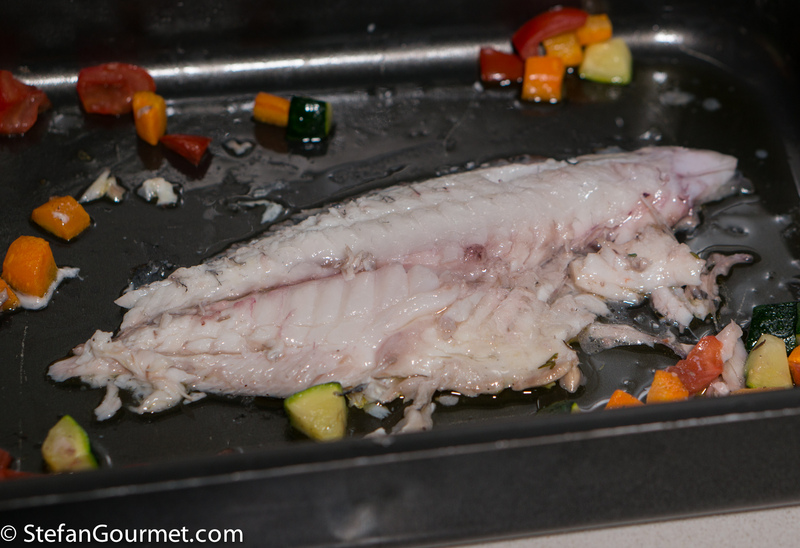 After the fish has been cooked, it will be shown to you again at the table. 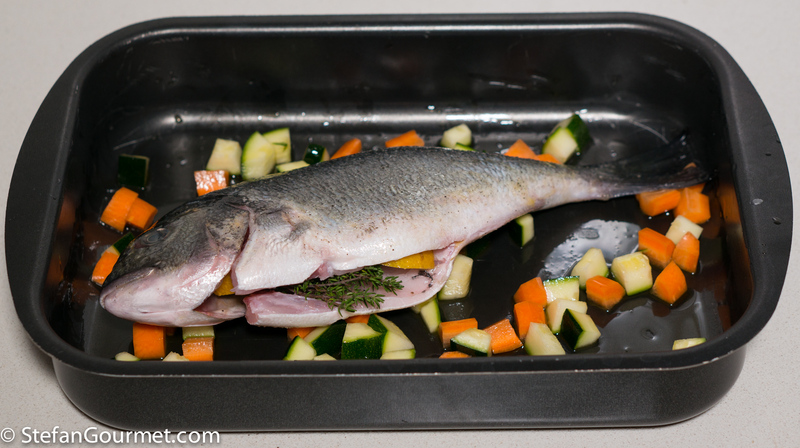 It is now either filleted and plated in front of you, or taken back to the kitchen for that. 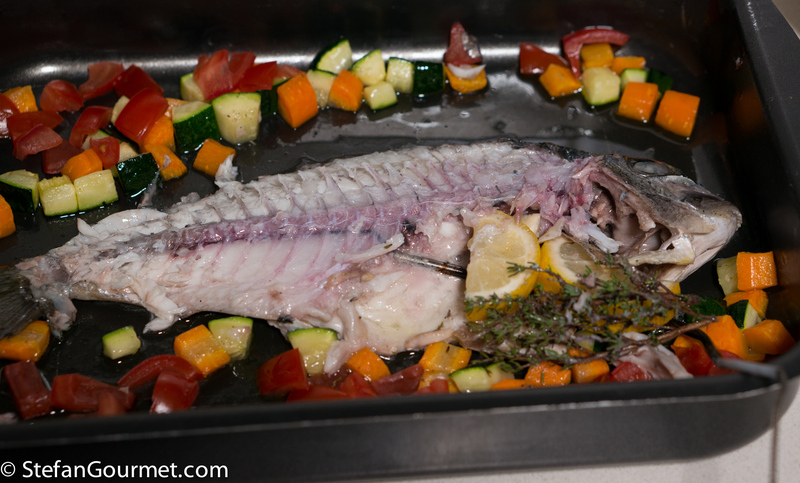 Season the fish inside and out with salt and freshly ground black pepper and rub it with extra virgin olive oil. Stuff the cavity with lemon, thyme, and garlic. Toss the diced zucchini and carrot with some extra virgin olive oil and scatter the vegetables in an oven dish. 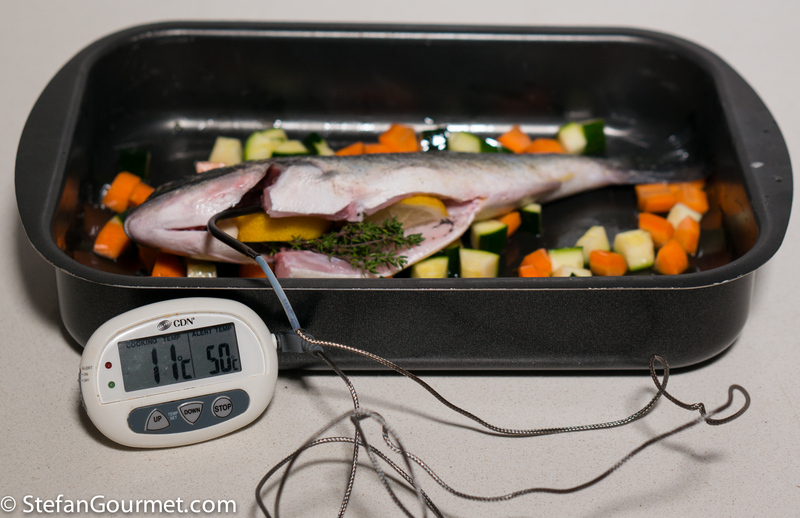 Insert the probe of an instant-read thermometer into the fish, such that the tip of the probe is in the center of the thickest part of the fish. Put the dish in the oven at 180C/350F. 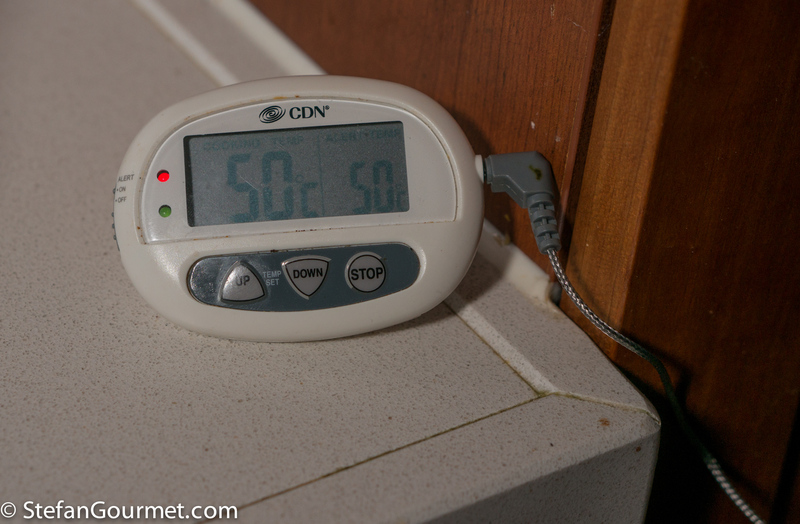 …until the core temperature of the fish reaches 50C/122F. This will take about 5 minutes. 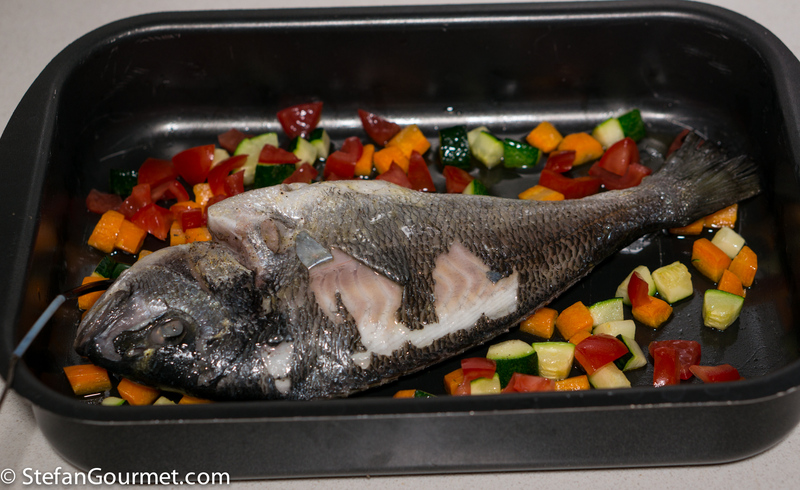 Now remove the skin from the top of the fish. 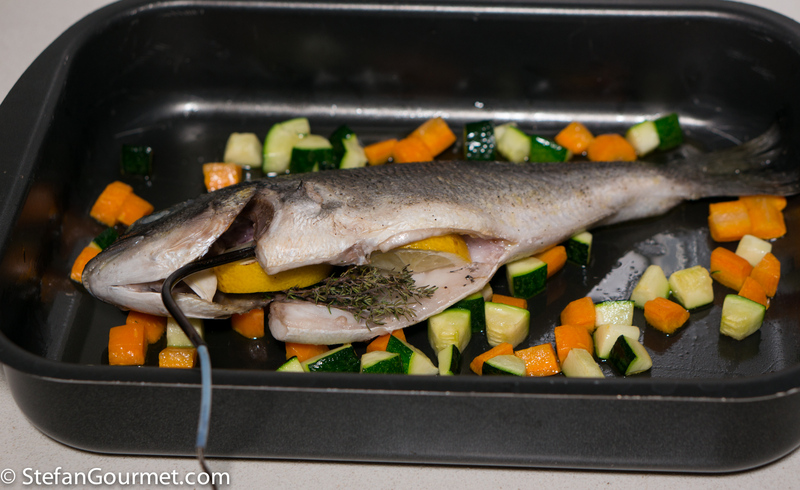 This is a gratuitous shot of the fish with the skin removed. Now carefully lift off the fillet and put it on a preheated plate. 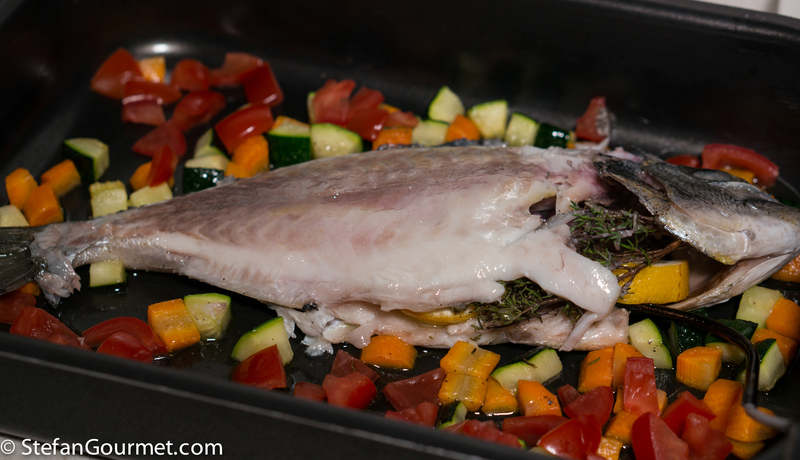 Remove the bones, then carefully transfer the other fillet (without the skin) to the other preheated plate. 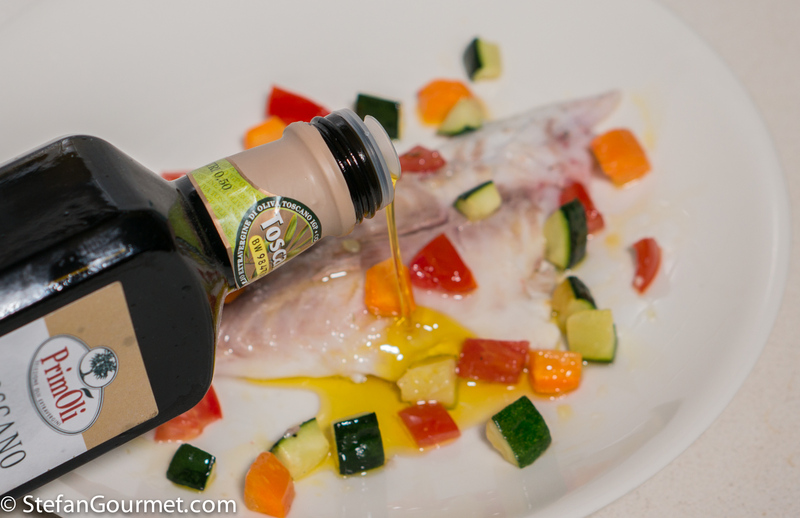 Arrange the vegetables on and around the fish, and drizzle with good quality extra virgin olive oil. The olive oil should be fragrant, if not then buy a better one. Season with salt and freshly ground black pepper, and serve. This is great with many dry white wines. 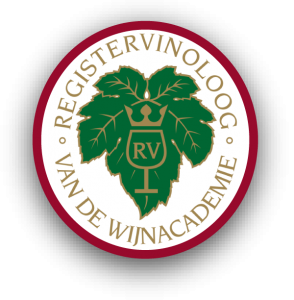 In Corsica it would of course be a local Vermentino, but Italian whites like Gavi or Verdicchio would also be outstanding. 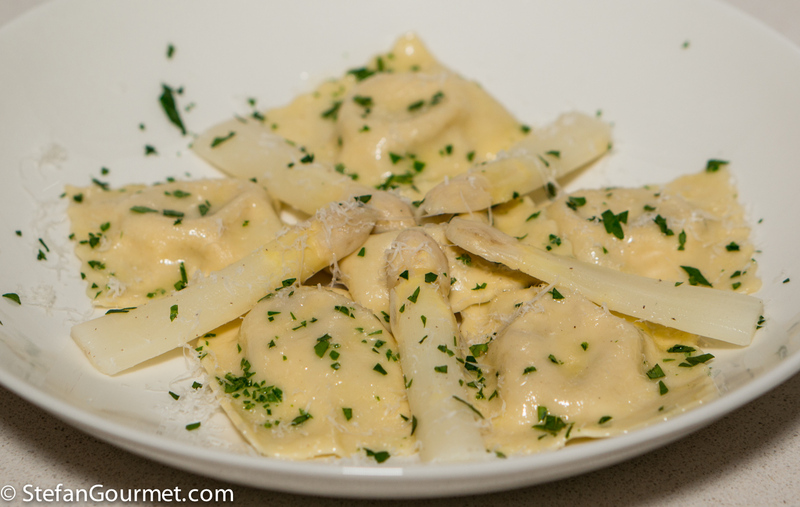 White asparagus are still in season here, and these white asparagus ravioli are a great way to serve them. L’orata al forno è uno dei miei piatti preferiti, e l’hai cucinata in modo perfetto! Am I at a modern art exhibition or indeed in your kitchen 🙂 ? No matter: love both art on the wall and, so appetizingly, on the plate . . . ! Make sure to visit the island next to it, Sardinia, as well. It is a lot cheaper, the food is better (Italian), the people are more friendly and the coast is at least as pretty. That’s interesting to know Stefan. Sardinia sounds wonderfu! It has been one of our favorite vacations ever and we plan to go back next year. Of course it is only a 2.5 hour flight for us. This looks (and I’m sure tasted) lovely, Stefan. The pricey fish menu doesn’t surprise me too much. 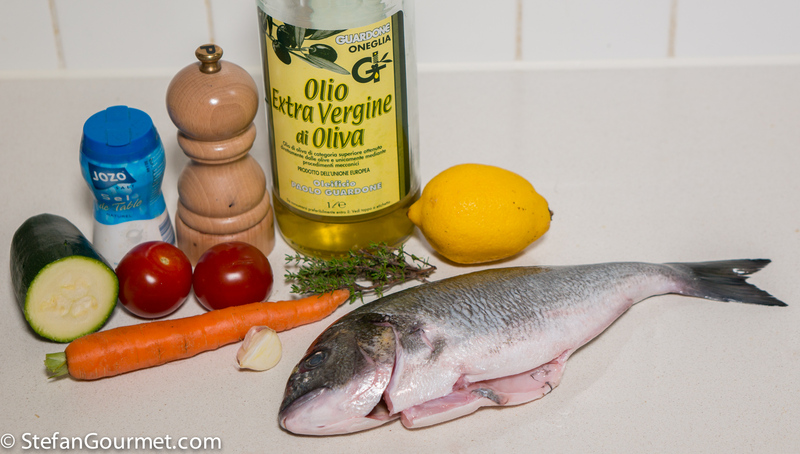 I bought a line cought sea bream recently, which was just enough for two people, for Eu25. Fresh fish does not come cheap. Very interesting. And it looks like modern art!